Was it really that smart of Noah Baumbach to open his latest “comedy” by making us read a scene of dialogue from a play? Even if it is an Isben play…and even if it is pertinent to the film’s major theme…which is essentially beware of the young? Hidden beyond this stroke of semi-alienating pretension is an almost accessible, quasi-mainstream comedy, Baumbach’s most enjoyable (though far from best) yet. Well, at least it immediately lets you know you’re in Baumbach territory. Our main characters are a documentarian/professor (Ben Stiller) and his producer wife (Naomi Watts). Only in movies, especially movies made by people like Woody Allen or Noah Baumbach (just like in any Franzen-esque pseudo-literary novel where everyone is a writer) is everyone involved in movies or the arts. This once seemingly hip middle-aged couple have lost their mojo, and they try to get it back by befriending a couple who came to one of his classes, an aspiring documentarian (Adam Driver) and his pretty, young artisanal ice-cream making wife (Amanda Seyfried). I balked at what the film was trying to make me believe…that Adam Driver (one of the most unlikable actors gracing the horizon of stardom) was supposed to be this generous, non-ironic, admirable seeker of truth and drinker of life. Ah, but alas…(spoiler alert!) things are not all what the seem…or in Driver’s case, turn out to be exactly what I suspected…this hipster douche acting like a hipster sage was in actuality…a hipster douche! 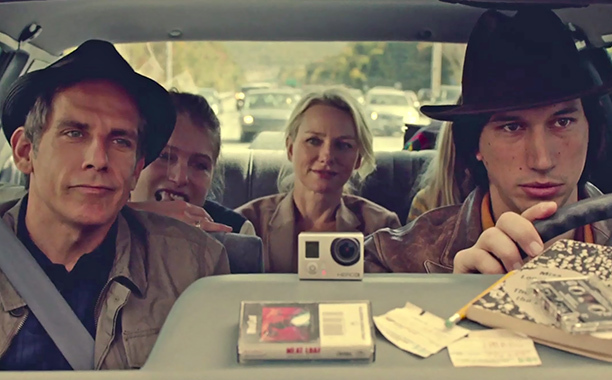 As is always the case, Baumbach peppers the film with sharp observational (sometimes judgmental) comedy and sound-bites amidst his odes-to-Woody conversational set pieces. His eschewing of the hipster scene (check out the vapidly ironic t-shirts of an aimless pretty girl named Tipper), upper-middle class artsy NY 40-somethings, and one particularly douche-tastic hedge-fund patron-of-the-arts are spot on. He also paints a clear picture of this 40-something couple caught between two worlds where they don’t fit in – that of their baby-spouting peers and that of the organic 20-somethings living as if the world is still their oyster. And as is the case with all of his films, the enjoyment factor is wholly dependent on the performance of his leads (imagine France Ha without Greta Gerwig…it would’ve been as insufferable as Girls). Stiller is right at home here and does some of his best work (remember how he and Gerwig also made Greenberg palatable?). Naomi Watts stretches the most…showing off her versatility as a comedic actress with substance. Together her and Stiller make the most of both Baumbach’s dialogue and his tendency to hone in on their facial expressions and reactions. Ironically the pair often speak more when they shut up. But still Baumbach can’t help himself. There’s that really long Isben quote. There’s a conceptually hilarious ayahuasca ceremony (google it) that goes on a bit long. And there’s a stretch towards the end that goes needlessly into pure drama territory. Then just when you think Baumbach is going to end on a high note and has us believing maybe this whole experience has turned Stiller and Watts into different people, he reminds us (with a great shot of their facial expressions upon watching a baby play with a smart-phone at an airport) that some things never change. Beware of the young. And beware of Baumbach. This entry was posted in Art-house Cinema, Movie Reviews, Movies and tagged Adam Driver, Amanda Seyfried, Ayahuasca Ceremony, Ben Stiller, Comedy, Documentary Fillmmakers, Generational Clashing, Henrik Ibsen, Hipsters, Naomi Watts, Noah Baumbach, NYC. It has its moments, but just as the credits rolled, I got the strangest feeling of having been smacked over the head. Very probably due to the image that they ended on. Yeah, Baumbach, kinda like the Driver character, bamboozled us. I agree it’s one of Stiller’s best (admittedly he set a pretty low bar for himself). And I also agree it is very Woody Allen-esque…but Baumbach always has been. I still think Watts is the real shiner here though – first time she has fully inhabited a comedic lead role and I think she knocks the nuances of it out of the park – but I have always been a Watts fan, so I might be a little biased.